The Kidde Alarmline II sensor cables are both tough and flexible and provide a cost-effective form of fire detection. They are simple to install and can be used for general area protection or proximity detection. The design and installation of the system can be specifically made to meet the needs of the risks which you are faced with through the use alarm temperatures, protective coatings and installation fixings. The Kidde Alarmline II sensor cables can withstand the toughest of conditions and can be integrated to any fire control panel through multiple inputs. The user is able to locate where the alarm has originated from along an extended digital sensor cables of up to 3000m using the Digital Location Control Unit. 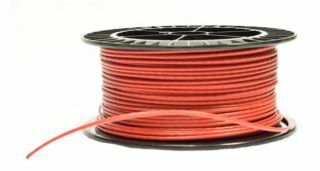 These specially designed cables are made up of a twisted pair of timetallic conductors, surrounded by a durable temperature sensitive polymer and a protective outer coating. The two inner conductors of the cable are twisted together so that there is a mechanical tension between them. The temperature sensitive polymer softens when it reaches a specific temperature, meaning that the two inner cores are forced together, creating a short circuit. The simple operation of the Alarmline II digital sensor cable means that it is compatible with any control equipment capable of accepting contact closure type initiating devices. The Alarmline II digital sensor cable range is made up of 4 different fixed alarm temperature cables with a selection of available protective outer coatings.